MyDraw for Windows is an advanced diagramming software and vector graphics drawing tool. 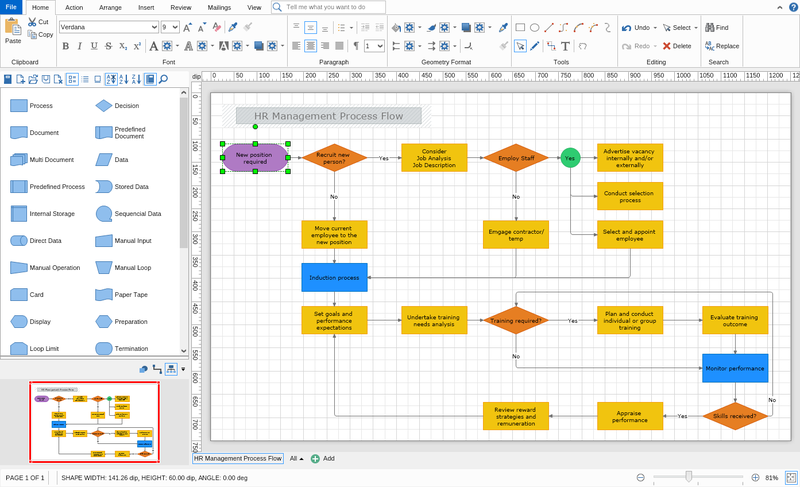 This diagram software includes powerful features to help you create flowcharts, org charts, mind maps, network diagrams, floor plans, family tree diagrams, general business diagrams, vector drawings, flyers, certificates and others. -100+ Diagram Examples and Templates - includes many ready-to-use templates for flowcharts, organizational charts, flyers, certificates & business cards, family tree diagrams and many other diagram types. -700+ Diagram Shapes and Symbols - more than 700 predefined shapes organized in 25 shape libraries. -MS Visio Compatibility - MyDraw is the best Microsoft Visio alternative for macOS (Mac OS X). You can use it to view, edit and save your Visio Drawing (VSDX) and Visio 2003-2010 Drawing (VSD, VDX) files. MyDraw can also be used a Visio viewer. You can also import and export Visio Stencils (VSSX) and Visio 2003-2010 Stencils (VSS, VSX). -Powerful Rich Text Support - powerful support for rich text and text formatting. You have full control over the text font, text styles, paragraph alignment, bullets and numbering, images, etc. -Advanced Table Support - support for tables with master cells, multi cell selection, text orientation etc. -Import of map data from ESRI shapefiles. -Support for creating and inserting in your diagrams more than 30 types of linear and matrix barcodes like EAN-13, UPC, UPC-A, Code-39, Code-128, ISBN, PDF417, Data Matrix, QR Code, etc. -GEDCOM Format Family Trees - the software supports importing from and exporting to GEDCOM format. This makes it the perfect tool for drawing family tree diagrams. -Export to PDF, SVG, EMF+, PNG, JPEG and BMP. -Import from SVG, WMF, EMF, EMF+, PNG, JPEG and BMP.